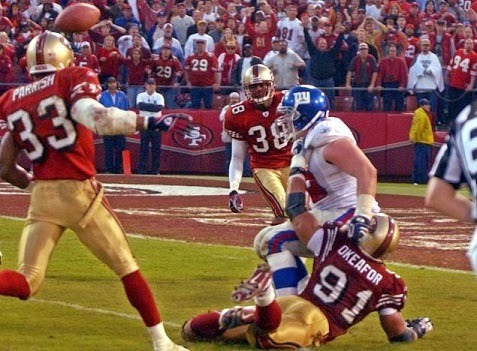 The Wild Card Playoff game in San Francisco on January 5, 2003 featured the San Francisco 49ers, winners of the NFC West with a 10-6 record, against the New York Giants, who finished second in the NFC East with an identical tally. 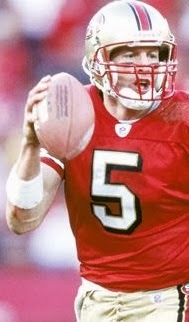 Coached by Steve Mariucci for the sixth year, the 49ers had a capable quarterback in Jeff Garcia (pictured at right), who was mobile and an accurate passer if not possessed of a strong arm. 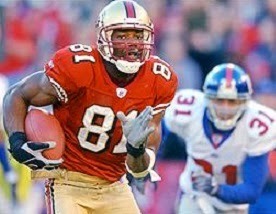 WR Terrell Owens was highly talented but could also be a temperamental distraction. Mariucci preferred ball control to big plays, and running backs Garrison Hearst and Kevan Barlow paced the ground attack. Injuries were an issue on defense, and the team tended to be vulnerable against the pass. New York, under Head Coach Jim Fassel, had bounced back from a disappointing 7-9 year in 2001 after winning the NFC Championship in 2000, coming on strong with four wins to close out the regular season after being 6-6 at the beginning of December. The offense had done especially well during the late surge, led by QB Kerry Collins and RB Tiki Barber. 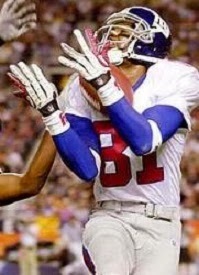 WR Amani Toomer paced the injury-depleted receiving corps and benefited from the presence of brash-but-talented rookie TE Jeremy Shockey. The defense, anchored by DE Michael Strahan, was good but showing signs of wear. The special teams had been a cause of concern throughout the season, and 41-year-old long snapper Trey Junkin was signed out of retirement five days before the game when long snapper Dan O’Leary was injured – a seemingly minor personnel change that would have a significant impact on the game’s outcome. There were 66,318 fans in attendance at 3Com Park. The Giants had the first possession and drove to the San Francisco 33, but a pass by Kerry Collins that was intended for RB Ron Dayne was intercepted by LB Julian Peterson, giving the 49ers the ball at their own 24. They immediately came through with a big play as Jeff Garcia threw to Terrell Owens (pictured below) for a 76-yard touchdown. Jeff Chandler added the extra point and San Francisco was ahead by 7-0 in stunning fashion. The teams traded punts until late in the opening period when the Giants put together an 11-play, 65-yard scoring drive. A 15-yard facemask penalty moved New York to the San Francisco 48 and Tiki Barber ran for four yards in a third-and-two situation to keep the series going. Collins completed a pass to Amani Toomer for 18 yards and another throw to Toomer completed the drive with a 12-yard touchdown. Matt Bryant’s PAT tied the score at 7-7. Early in the second quarter, New York had another scoring possession, this time advancing 61 yards in five plays. Barber had a 29-yard run to the San Francisco 32 and Collins completed a pass to Jeremy Shockey for 27 yards to the one. After Barber was stopped for a loss of a yard, a two-yard Collins throw to Shockey was good for a TD and Bryant added the extra point to make it a seven-point lead for the visitors. The 49ers came back with a 69-yard drive in ten plays. Garcia threw to Owens for ten yards and ran for 11 yards to the New York 46. Another carry by the quarterback was good for ten yards on a third-and-six play and Owens threw an option pass to WR Tai Streets that picked up 25 yards to the seven yard line. Kevan Barlow scored a touchdown from a yard out and Chandler’s point after again tied the score at 14-14. The Giants had to punt but got a huge break when WR Cedrick Wilson muffed the catch and safety Johnnie Harris recovered at the San Francisco eight. From there on the next play, Collins connected with Toomer for a touchdown. Before the half, New York drove to another score thanks to a turnover, this time an interception by CB Jason Sehorn that gave the Giants the ball at their own 44. They went 56 yards in five plays, the highlights being a Collins throw to Barber that picked up 30 yards in a third-and-eight situation and then a pass to Toomer for a 24-yard TD with ten seconds left on the clock. Bryant kicked his fourth extra point of the game and the visitors held a 28-14 halftime lead. In the third quarter, after the 49ers failed to convert a fourth down at the New York 46, the Giants added to their lead. Barber had a 22-yard carry to the San Francisco 32 and Collins threw to Toomer for 17 yards. Barber ran for a six-yard touchdown and, with Bryant’s extra point, New York was ahead by 35-14. The 49ers went three-and-out and had to punt, and the Giants followed up with a nine-play, 63-yard drive. Collins connected with Toomer, this time for 46 yards to the San Francisco three. New York was unable to score another touchdown from there, with Shockey dropping a pass in the end zone, and settled for a 21-yard Bryant field goal, but being ahead by a commanding 38-14, it seemed insignificant at that point. The 49ers, with their backs very much to the wall, proceeded to advance 70 yards in seven plays. Garcia completed passes to TE Eric Johnson for 12 yards, Streets for 11, and then, following a short running play, to Owens for 12 yards to the New York 32. A throw to Owens for a 26-yard touchdown finished off the series and Garcia threw to Owens again for a two-point conversion that narrowed the tally to 38-22. Following a short possession by the Giants, the 49ers got the ball back on a short punt of 29 yards by Matt Allen that had 15 yards assessed due to a personal foul called on LB Dhani Jones. Starting off at the New York 27, Garcia completed two passes, the second to WR J.J. Stokes for ten yards to finish off the period. On the first play of the fourth quarter, Garcia ran for 14 yards and a TD. Once again, he threw to Owens for a two-point conversion and the once-huge New York lead was down to 38-30 with nearly a full quarter to play. The Giants were again quiet on offense, punting after three plays, and the 49ers put together a long scoring drive of 74 yards in 15 plays. Garcia completed a pass to Owens for 21 yards and to Cedrick Wilson for 18 yards to the New York 38. On a fourth-and-one play, Streets caught a pass for four yards to the 25 and, facing third-and-five, Garcia connected with Owens once more to the 11. The possession finally ended with Chandler kicking a 25-yard field goal, and it was a five-point game at 38-33. The reeling Giants finally put something together offensively on their next series. Collins completed three passes, two to Shockey of seven and nine yards, and one to TE Dan Campbell for 10 yards. They reached the San Francisco 24, but with a chance to add vital points to their lead, a bad snap by Trey Junkin led to a poor hold and Bryant’s 42-yard kick was well off the mark. Once again the 49ers put together a long series, this time of 68 yards in nine plays. Facing third-and-six at his own 36, Garcia threw to Owens for seven yards and passed to Johnson for 25 yards to the New York 25. Keeping the ball, Garcia ran for 12 yards and then passed to Streets for a 13-yard touchdown. The try for two points failed, with Owens and SS Shaun Williams drawing offsetting unnecessary roughness penalties, and while San Francisco had the lead, it was by just a point with a minute to play. RB Delvin Joyce returned the ensuing kickoff 32 yards to give the Giants good starting field position at their 48. Collins passed to WR Ron Dixon for 10 yards and, following an incompletion, connected with Dixon again for 19 yards to the San Francisco 28. A run by Barber moved the ball to the 23 and the Giants took their last timeout. It seemed as though the visitors would prevail when they lined up for a field goal attempt of 41 yards with six seconds left on the clock. But Junkin snapped the ball too low and holder Matt Allen couldn’t handle it. The desperate Allen rolled out and threw toward G Rich Seubert, who was in the act of being pulled down by San Francisco LB Chike Okeafor (pictured below). The ball fell to the ground with no time left, but the Giants were looking for a flag for pass interference. After the officials conferred, a flag was indeed thrown – against the Giants for having an ineligible receiver downfield. San Francisco came away with an astonishing 39-38 win. Coming back from a 24-point deficit, it was the biggest comeback in NFC playoff history (and, at the time, the second-biggest in NFL history), and was punctuated in bizarre fashion. The next day, the NFL acknowledged that the officials had blown the call on the game-ending broken field goal attempt. There should have been an offsetting pass interference penalty on the 49ers, which would have allowed the Giants another chance at kicking the field goal (while Seubert had reported in as an eligible receiver, another guard, Tam Hopkins, was illegally downfield on the play). The statistics were as even as the score. Both teams gained 446 yards apiece, with the 49ers having the edge in net passing yards (356 to 327) and New York gaining more on the ground (119 to 90). The Giants had the edge in first downs (26 to 23). The 49ers registered the only two sacks of the game, but also turned the ball over twice, to one suffered by New York. Jeff Garcia completed 27 of 44 passes for 331 yards and three touchdowns with one interception and also led the team in rushing with 60 yards on seven carries that included the game-winning TD. Terrell Owens had 9 catches for 177 yards and two touchdowns, plus the pair of two-point conversions and a pass completion of 25 yards (his only pass of the year). Eric Johnson added 8 pass receptions for 78 yards and Tai Streets contributed five catches for 58 yards and a score. For the Giants, Kerry Collins was successful on 29 of 43 throws for 342 yards and four TDs while tossing one interception. Amani Toomer (pictured at right) was the primary beneficiary, with 8 receptions for 136 yards and three touchdowns. Jeremy Shockey contributed 7 catches for 68 yards and a TD, but his drop in the end zone ultimately proved costly. Tiki Barber ran for 115 yards on 26 carries that included a score, and added 62 yards on five pass receptions. “I tried to make the perfect snap instead of a good snap,” said a disconsolate Trey Junkin. “You can’t do that…If you can’t count on me at the end of the game, that’s it, I’m done.” It was a sad end to a 19-season NFL career that had begun with Buffalo in 1983. The 49ers played Tampa Bay in the Divisional round the next week and lost badly, after which Steve Mariucci was dismissed as head coach. San Francisco went into a long period of decline, not reaching the playoffs, or even posting a winning record, until 2011. New York also fell off in 2003, going 4-12, but would return to the postseason in ’05, after Jim Fassel had been replaced by Tom Coughlin.